Are you in the market for a new mattress, but just don’t know what you want? Look no further. The Simba mattress has arrived and hopes to fill that void in your bedroom. Although a new company, Simba has quickly made a name for themselves. Will this hybrid mattress stack up to the reputation they’ve already built? Continue reading below to find out! Don’t have a whole lot of time? No problem. Click here and we’ll take you on down to the review summary. The Simba mattress is a 25cm mattress built from 4 separate layers of latex, coils, poly foam, and memory foam. Top layer (cooling + comfort) – 5cm of latex foam. 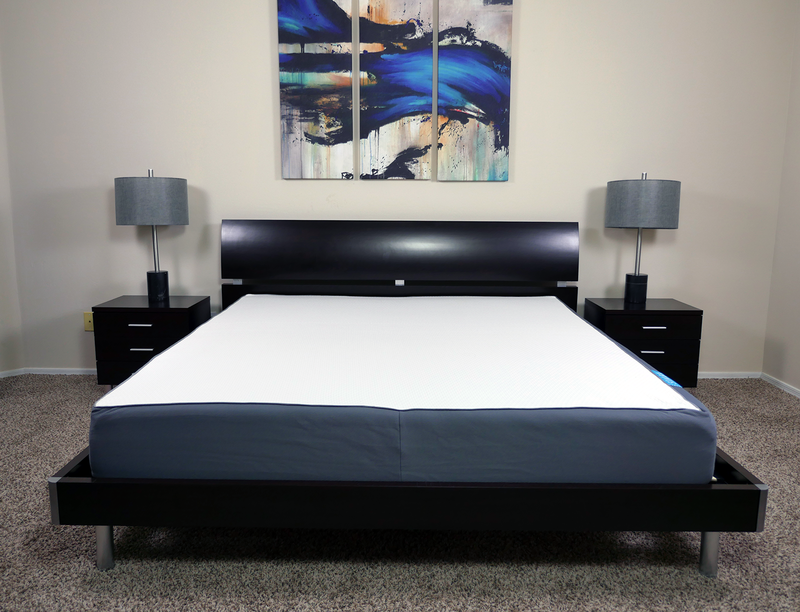 This top layer of latex foam is designed to provide much of the cooling, bounce, and comfort for the mattress. 2nd layer (contour) – 2cm of foam encased microcoils. With a thin layer of microcoils, this layer works to provide most of the contour to the sleeper. These coils also assist in adding bounce and response to the mattress. 3rd layer (support) – 3cm of memory foam. By placing a layer of memory foam between the foundation and microcoils, the 3rd layer is able to act as a softer transitional layer in addition to the support and deep compression support for the mattress. Bottom layer (foundation) – 15cm of support foam. This bottom layer provides much of the shape for the mattress and acts as the foundational base for the mattress as a whole. The cover of the Simba mattress is built from 100% polyester. Thin by design, the cover of this mattress is stretchy, responsive, and breathable. After tugging on the cover from several different angles, it was able to easily pop right back into shape. Additionally, the cover breathes extremely well. With no foam integrated into the cover, air is able to easily flow in and out of the cover. Aesthetically, there’s not a whole lot to the Simba’s cover. An all white top layer followed by grey side panels makes for a simple, yet sleek look. The Simba mattress comes in at a 6 out of 10 on the firmness scale, where 10 is the most firm. By creating a medium firm feel, Simba hoped to meet a vast majority of sleeper’s needs. The feel of the Simba is a little different than most mattresses I have tested in the UK. With a top layer of latex, the mattress is both responsive and comfortable. I was able to apply a good amount of pressure to this top layer and receive a nice level of sinkage without any pressure points being created. The layer of microcoils used below the top layer of latex helped to round out this feel. The coils compress as pressure is applied and act as a nice transition into the memory foam layer below. Yet, with this memory foam you do not encounter the deeper, more pronounced level of sinkage and hug as you would with more traditional memory foam mattresses. Instead, the top two layers create more of a rounded contour with a moderate level of sinkage overall. FAQ: Do I need a divan? Support was another area where the Simba did well. Although I struggled to sleep on my stomach, sleeping on my back and side were much better. Initially, I liked the contour of the mattress while lying on my stomach. Yet, after about 10 minutes of lying there, I noticed the mattress wanted to contour even more so around my mid section. This created pressure around my lower back, and forced me to change positions. However, this experience could be attributed to my lighter stature. Heavier stomach sleepers will sink into the mattress in a more balanced manner, creating a more consistent level of sinkage. All that said, stomach sleeping is fairly rare among most sleepers. Side sleepers especially will likely find the contour and hug of the Simba to be a good mix of sinkage, contour, and support. 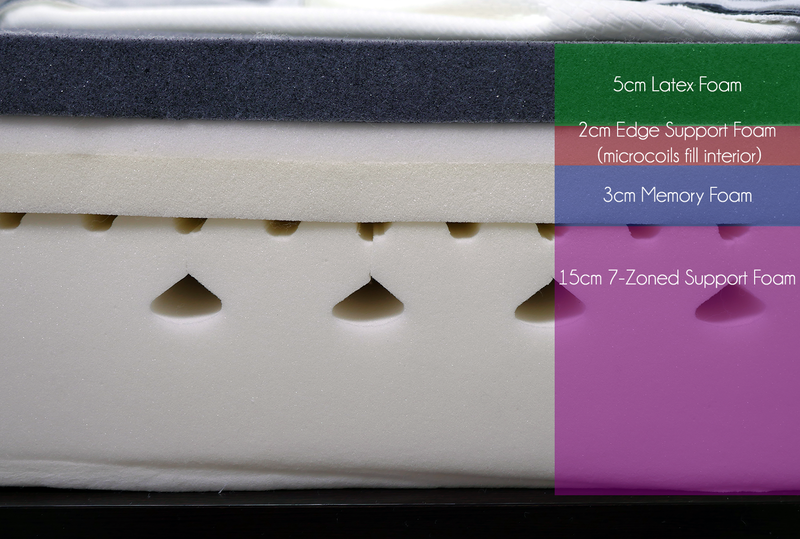 The zoned support foam is tuned with side and back sleepers in mind. So while I wouldn’t advise the Simba for most stomach sleepers, for side and back it does a nice job of creating pressure relief and support where you need it most. Cooling on the Simba was quite nice. Once again, the top layer of latex and second layer of microcoils came together to create a highly breathable top half of the mattress. Not to mention, the Simba uses a thinner cover, allowing air to easily make its way in and out of the mattress. Therefore, the sleeping surface of the Simba is able to maintain a cooler temperature. There was never a point that I felt hot during my sleep test on the Simba mattress. Next up, regarding bounce. Although it does contain coils, I would not expect the microcoils to respond to pressures as well as they do. By no means is the response time instantaneous, but there is not much of a lag either. That said, the microcoils should not be confused with traditional coils. They do not have the same level of bounce or push back as a true high profile or contour steel coil will. 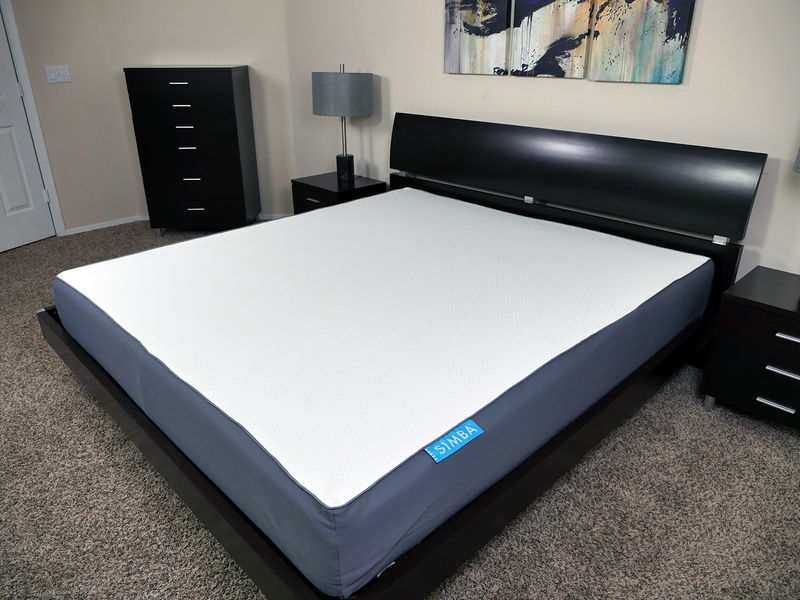 Simba’s microcoils simply add a little extra response, ease support transition, and create a little more bounce than you would ordinarily get from an all foam mattress. Finally, edge support. All of the layers work extremely well together to prevent a collapsing of the edge and maintain a good level of support around the perimeter of this mattress. So whether you’re someone who likes to sleep close to the edge, or simply use it for daily activities, this mattress is a good performer. All in all, I’m a fan of the Simba mattress. Each area I tested performed well. Balanced levels of sinkage and hug in addition to good bounce, response, pressure relief, support, and edge support helped to create a well-rounded feel. All mattress reviews on Sleepopolis involve a short series of sinkage tests. These tests are designed to provide you with an insight into how the mattress responds to various positions. Lying on your back – as I lied down on my back with my weight spread evenly across the mattress, I saw 4-7.5cm of sinkage. Lying on your side – whilst lying on my side, I saw 4-9cm of sinkage. Sitting on edge (conservative) – in a normal sitting position with my bottom slightly further back on the mattress, I saw 9-10cm of sinkage. Sitting on edge (aggressive) – as I sat on the direct edge of the mattress, I saw 9-10cm of sinkage. Standing in the middle – with all of my weight placed at one point on the mattress, I saw 15cm of sinkage. Please keep in mind that sinkage results will vary dependent on your body type and weight. For the sake of reference, I weigh 10 stones. Who should buy the Simba mattress? Want a medium to medium firm feel – the Simba mattress lands at a 6 out of 10 on the firmness scale, where 10 is the most firm. Want a hybrid mattress – this mattress does provide a slightly different feel than most traditional mattresses, due to its design. 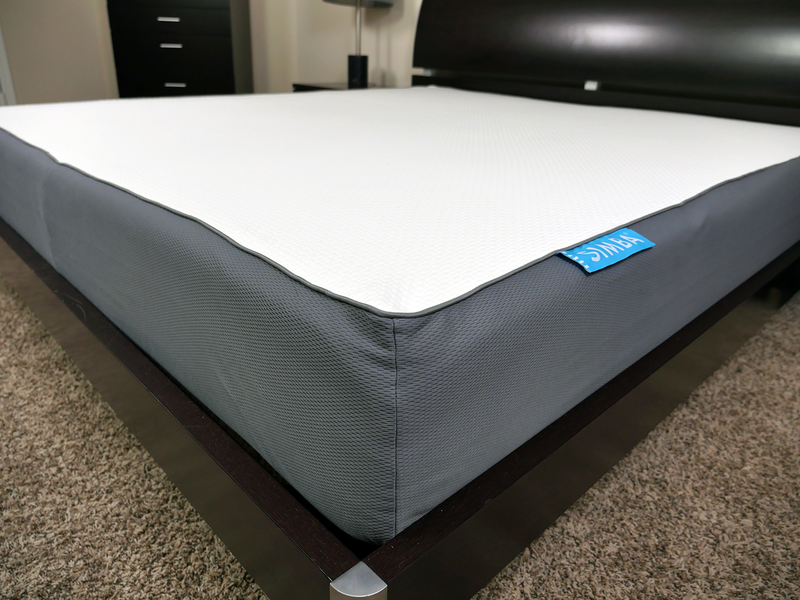 As a hybrid mattress, the Simba uses latex, microcoils, memory foam, and a 7-zoned support foam. The combination of these materials makes for a responsive mattress with good support and type of contour that’s ideal for side and back sleepers. Want above average response time – top layers of latex and microcoils help this mattress respond to pressure in a fairly fast manner. The response time is not instantaneous due to the memory foam third layer, but it is most definitely faster than most foam mattresses I’ve tested. Want good edge support – with an extra layer of foam placed around the perimeter of the coils, the Simba does a great job of maintaining its support around the edges. For more on the Simba mattress visit SimbaSleep.co.uk. The Simba mattress is a hybrid mattress design the uses layers of latex foam, poly foam, memory foam, and micro coils. The combination creates a responsive balanced feel with good bounce and solid edge support. The Simba is a medium feel and appropriate for most sleepers. At £699 for a King it’s a solid value and offers considerable savings over in-store alternatives.